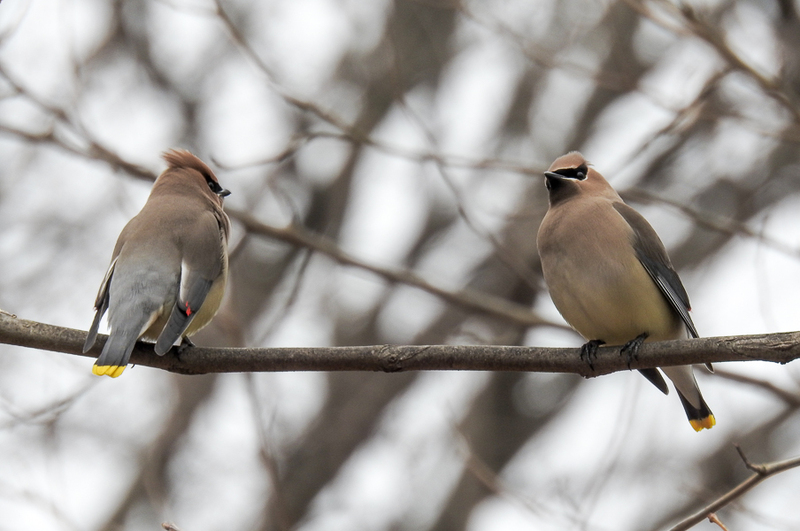 We don’t see Cedar Waxwings in the yard very often. We are working on increasing our berry producing bushes to appeal to birds like Cedar Waxwings and Northern Mockingbirds that don’t eat seed at feeders, but our small berry bushes do interest the occasional small group, as do random berry producing vines that find their way into the tops of trees in our yard and neighbor’s yards. 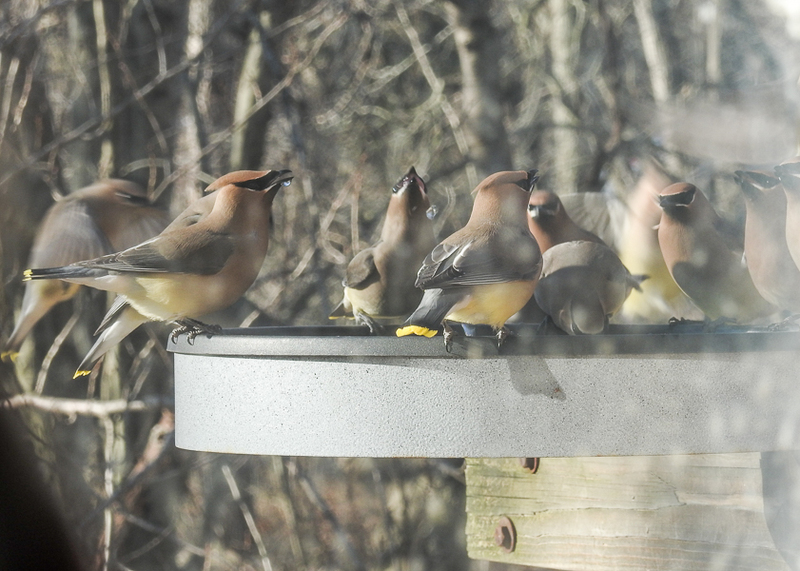 Seven Cedar Waxwings showed up in the yard just a week ago and I was thrilled to see them. But what they mostly like from our yard is water. Here in Maryland, the climate continues to do it’s weird rollercoaster thing this year and for the past week it’s been very cold which is probably freezing up some of their natural water sources. On Saturday we were working on a project in our yard. (A neighbor’s tree fell on our detached stick-built garage just before Thanksgiving last year and we had to tear it down. A replacement garage was delivered by truck last week and we spent the weekend trying to fix the pad underneath it that wasn’t leveled properly. Sigh.) So we spent a big chunk of the day in the back yard. Partway through the day, I went into the house and, looking through the living room window, noticed that the shallow heated birdbath on the front porch was dry. Because I don’t want to burn out the heating unit built into the thing, I’m always careful to keep water in it and was surprised that it was suddenly empty. I quickly filled it up again before going back outside. A bit later, standing next to the garage, I happened to look up over the roofline of our house and saw a ton of birds sitting up in the top branches of the trees in the front yard. They didn’t look right for Grackles or Starlings or Red-winged Blackbirds and they weren’t being noisy like a flock of those birds would be either. And they were larger than the House Finches that we typically see sitting high in the trees. 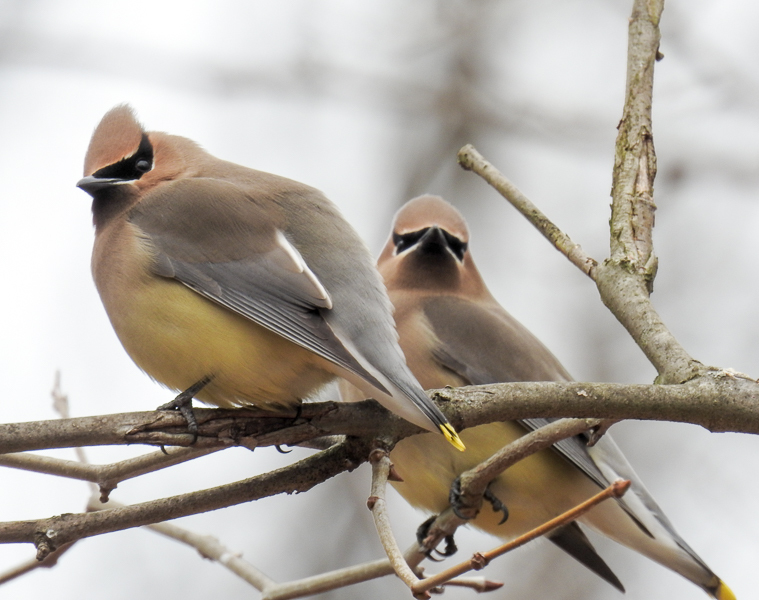 These were in fact Cedar Waxwings. At that point, they were sitting very still, so I was able to easily count fifty-six of them, although there may have been more that I couldn’t see obscured by the house. The birds didn’t seem to be eating anything. They just seemed to be waiting for something. I suspect they were deciding whether it was safe to come down to the various birdbaths in the yard while two humans were moving gravel around in the back yard. Even though we were out there working, there was a big variety of other birds active at the feeders that weren’t all that far away. I’ve noticed that when new-to-the-yard birds visit, they will often scope out the activities of the regular birds first as if to determine if it is safe. I don’t know what is in a bird’s mind, but it seems reasonable to me that they may figure, “Well, those weirdly behaving humans aren’t bothering any of the other birds, so it’s worth taking the risk, and we’re thirsty.” Or maybe it had nothing to do with us and they were just making sure the other birds in the yard wouldn’t react badly to them. Interestingly, although we have six birdbaths in the yard, and the temperatures had risen enough that the ice had partially melted in the un-heated ones, this crowd would target one birdbath at a time. They seemed incredibly polite about it too. They would move as a group to the upper branches of the trees nearest the birdbath they wanted to use. Then they would descend on it in mass in an orderly, ever moving rotation. 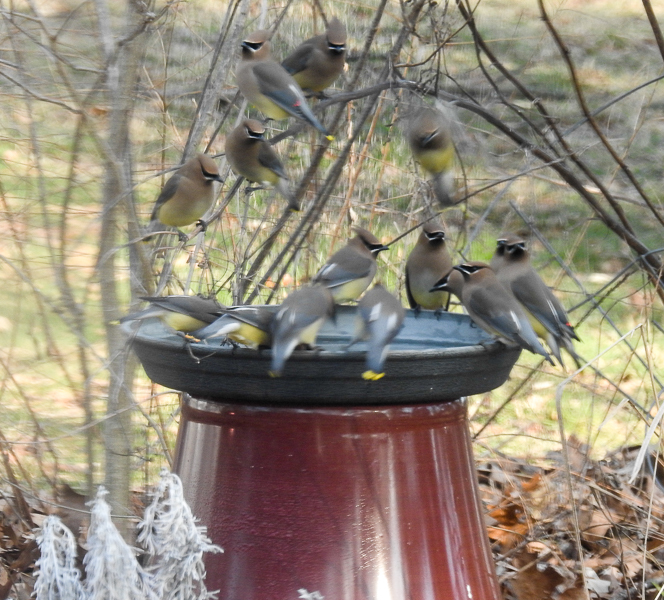 A dozen or more of the birds would swoop down and efficiently arrange themselves around the rim of the birdbath. Each would take four or five deep sips of water and then would fly back up into the tree to make room for another bird who would would do the same. For several minutes, that one birdbath would be the center of this winged rotation and then they would retreat again as a group, only to descend on a different birdbath when the group would return to the yard a bit later. If another bird wanted to use the birdbath at the same time, there seemed to be no problem. I saw House Finches, Northern Cardinals, Goldfinches, American Robins and Mourning Doves all drinking at the same time with the Cedar Waxwings at various points. 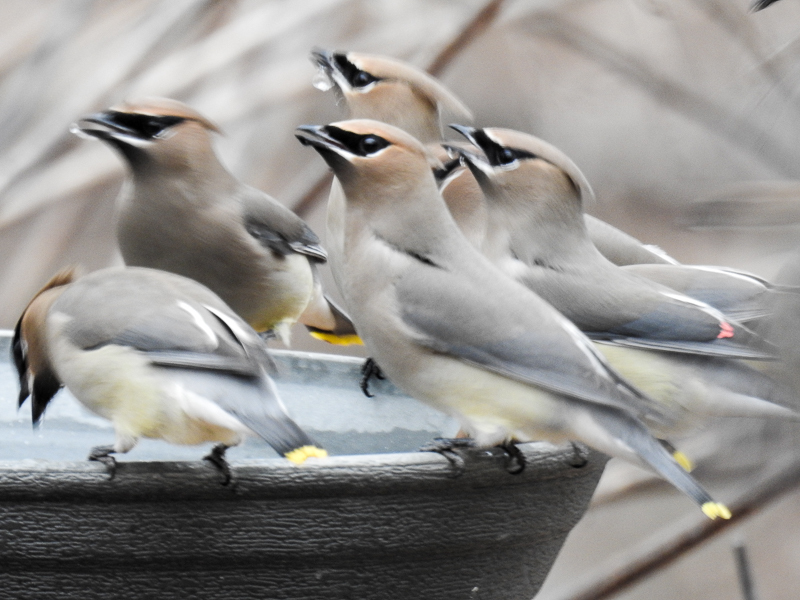 We watched them do this coordinated group drink on the heated birdbath out back and then on an unheated one in the center of the back yard. They must have done it again on the heated birdbath on the front porch, because when I went back inside, it was empty again. With such a big group, they could have split up among the six birdbaths and all drunk water at the same time, but instead they would all target one water source at a time and take turns. It was awesome to watch. 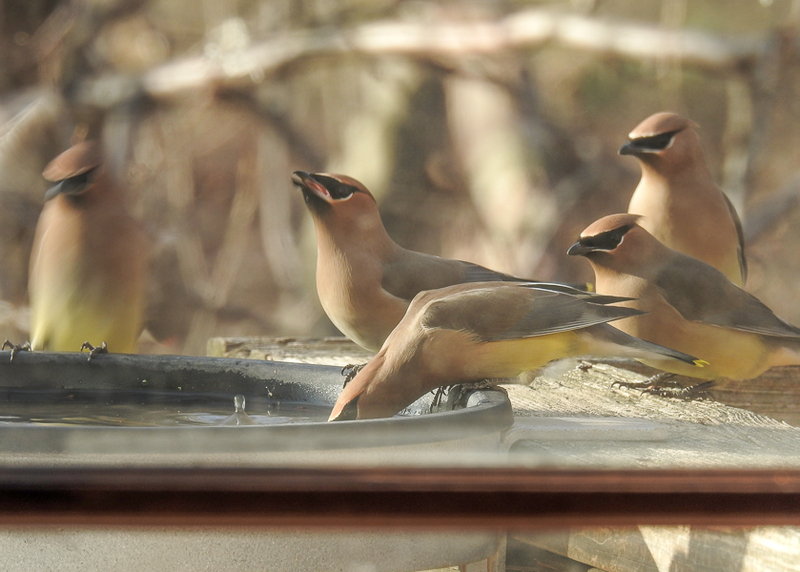 The group, or at least some of them, returned Sunday to the birdbath on the front porch. Not wanting to startle them, I first watched them from across the living room. Then when they left, I settled myself on the couch on the other side of the window from the birdbath. About fifteen minutes later, a group of them was back at the birdbath, giving me a view of these beautiful birds just five feet away. Very cool! Since then they’ve returned periodically, closing a different birdbath each time. This morning, they seemed interested in the heated birdbath in the back yard but the Blue Jays were swooping in one after another to pick peanuts from a nearby bird feeder, so the Waxwings switched their focus to the frozen again birdbath further out in the yard. Birds can get water from a frozen surface, but it takes them longer, so each bird sat a little longer at the frozen feeder but they still basically took turns. After awhile, I went outside and added some fresh water to that feeder but they switched over to the heated feeder on the front porch again. I suspect that this group of Cedar Waxwings has found a good source of berries somewhere nearby, although not in my yard, and is coming by every now and then to get a drink to wash it down. I don’t imagine they’ll hang around forever, but it is fun watching them while they are here. Very interesting. They are beautiful. May I ask a question? What you recommend for a bird bath for the winter? Thank you.